For the past two months Tyler (Legohaulic) and I have been working on a collaboration project for Brickworld. We wanted to present our distinguishable styles in a cohesive sci-fi diorama. At the same time, we strove for the unprecedented by incorporating lights, motion, and even music (through built-in iPod speakers) on top of a dark tan and sand green color scheme. We are proud to present Containment. Our creation depicts a one man operated biosphere processing facility towering over an alien wasteland. The two worlds are separated, but one question can be asked for both: which one is contained? While it seems apparent that the primitive aliens are kept out of the advanced and sterile facility, another look reveals the absolute isolation of the operator. Our teasers introduce the backstory for the creation. I think you should have added some fire or an explosion or something, it just seems too… static. You know? There’s nothing to get people stop and inspect it. Wow! I thought the overall design of the MOC itself was impressive, then I watched the fantastic video. I love the lights on the conveyor belt and the ball ramp is fun to watch. Great use of the racing tracks as well. Wonderful colors and design. This creation truly stretches the imagination of the brick. Great job! good lord! just…..wow. I love LEGO, but it usually doesn’t leave me speechless. I love how alive this whole thing looks. Fantastic job guys. It’s one thing to create an awesome looking static MOC, it’s another entirely to make it feel real. Amazing Creation! Of course amazing because of the size of the diorama but mostly for the refinement of the details! It`s so good that it can`t be real. It`s fake. Am I right? Great diorama! Love it! The details and color scheme are excellent. Very post-apocalyptic. Also am diggin’ the conveyor belt with the scrap/refuse and that crashed looking spaceship on the right. A great model. Very inspiriing in it’s details and engineering. Great job guys! Really easy on the eyes. I absolutely cannot wait to see this in person. 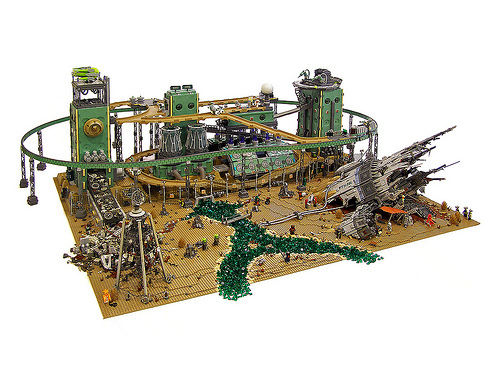 I remember seeing Legohaulic’s Matrix Diorama last year and I was completely blown away. That thing should’ve been in the main showroom. One more day…I CAN’T WAIT. Sorry to have missed this at Brickworld. Will you be bringing it to BrickCon as well?